Basidiobolomycosis is a rare fungal infection that may affect the gastrointestinal tract. It is caused by Basidiobolus ranarum and less than 80 cases have been reported in the literature. The incidence seems to be higher in the Middle East and in particular Saudi Arabia where most cases are diagnosed in the south-western region. An 18-year-old woman presented to the emergency department with an obstructing caecal mass initially suspected to be malignant. 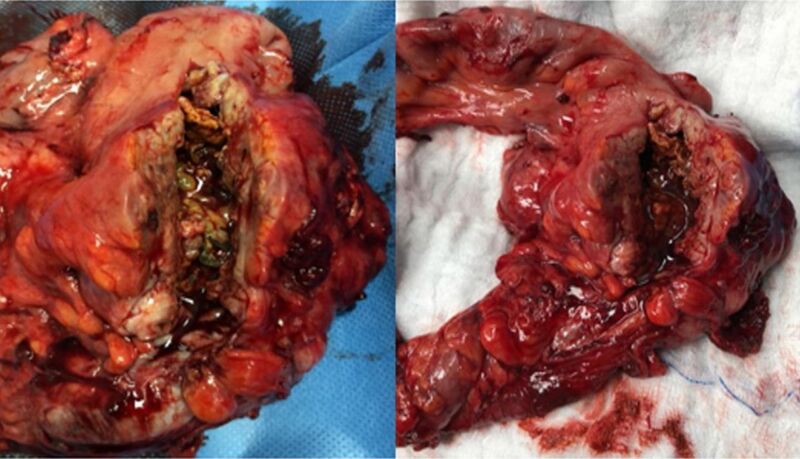 Surgical resection was complicated by bowel perforation, histology and cultures confirmed basidiobolomycosis infection. The postoperative course was complicated by an enterocutaneous fistula, fungal intra-abdominal abscesses, liver and lung abscesses, formation of mycotic hepatic artery aneurysm and meningoencephalitis. The patient eventually expired due to sepsis despite aggressive treatment. Diagnosis and management of such rare cases are very challenging and require a multidisciplinary approach. Complications are common and associated with a high mortality. In view of the rarity of the disease, the diagnosis and management can be challenging. 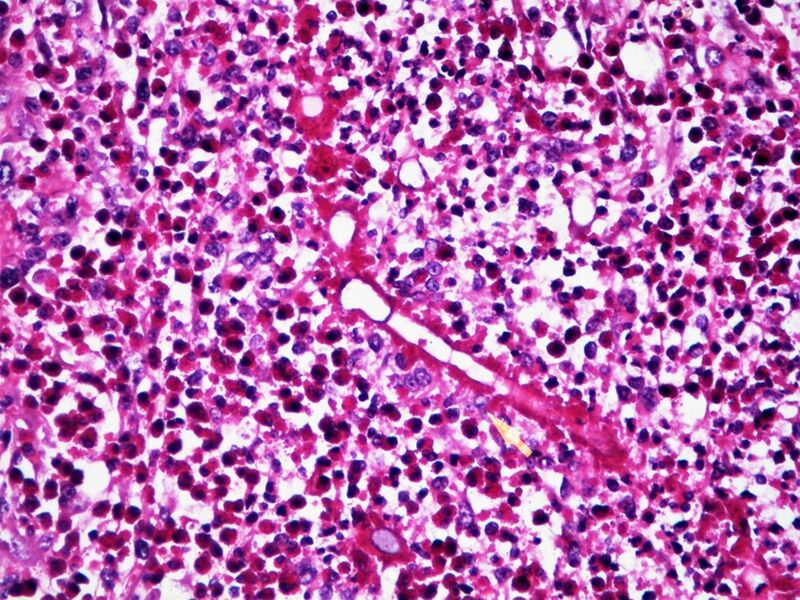 The nature of the infection can result in several life-threatening complications that can be missed during the course of treatment such as hepatic artery aneurysm, liver and lung abscesses. The reported case is unique as it encompasses several major basidiobolomycosis-related complications that resulted from disseminated fungal infection leading to a fatal outcome. An 18-year-old Saudi woman, originally from Jazan city, south of Saudi Arabia, presented to the emergency department with a 2-week history of right lower quadrant (RLQ) abdominal pain associated with nausea, vomiting and anorexia. She had no fever. Medical and surgical history were unremarkable, and she was not on any medications. She claimed she had eaten decayed wheat few weeks before. On clinical examination, the abdomen was distended with tenderness in the RLQ where a fullness could be appreciated. A CT scan of the abdomen and pelvis was carried out, and this showed an obstructing caecal mass suggestive of a malignant process without distant metastases (figure 1). 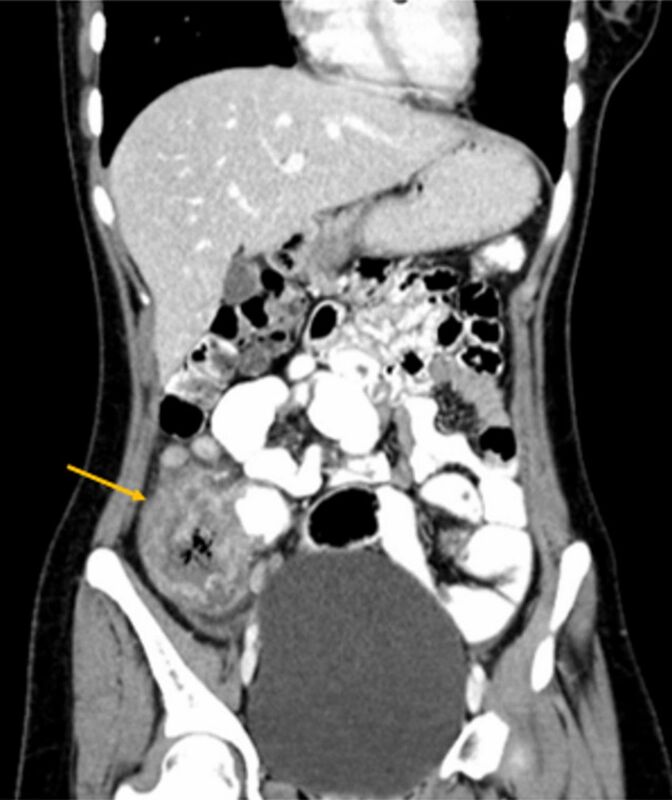 Coronal enhanced CT of the abdomen showing an obstructing caecal mass (arrow). A colonoscopy was performed and revealed a necrotic caecal mass. Multiple biopsies were taken, and these showed only necrotic tissue. In view of the obstructive symptoms, decision was made for surgery, and a laparotomy with right hemicolectomy and primary anastomosis was performed. 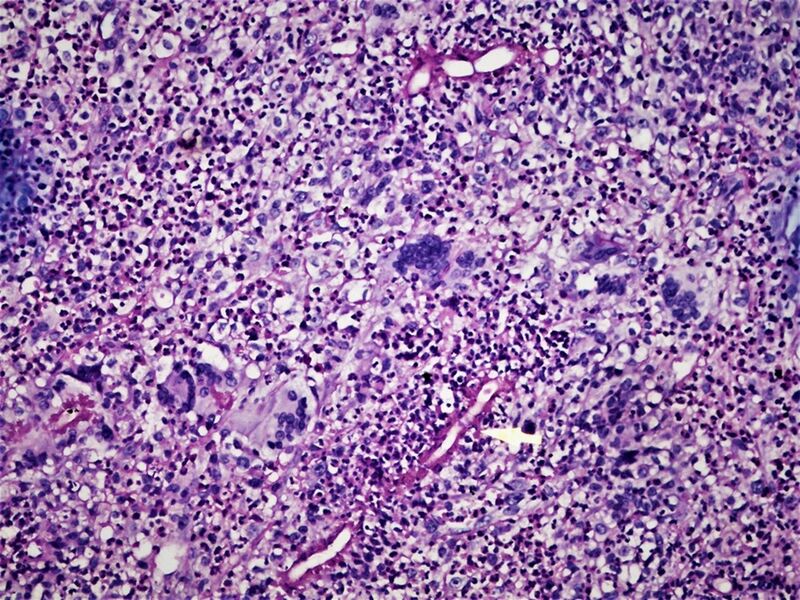 Histopathology was negative for malignancy and showed ulcerations, necrosis, microabscesses and multinucleated giant cells. Fungal hyphae were seen suggesting infectious colitis (figure 2). Further microbiology studies were not feasible as the specimen had been fixed in formalin. The patient was empirically started on antifungal treatment with intravenous amphotericin B 300 mg/day. Postoperatively, the patient developed jaundice, high fever and per-rectal bleeding. Blood tests showed a white cell count reaching 33×109/L with eosinophilia and deranged liver function tests. 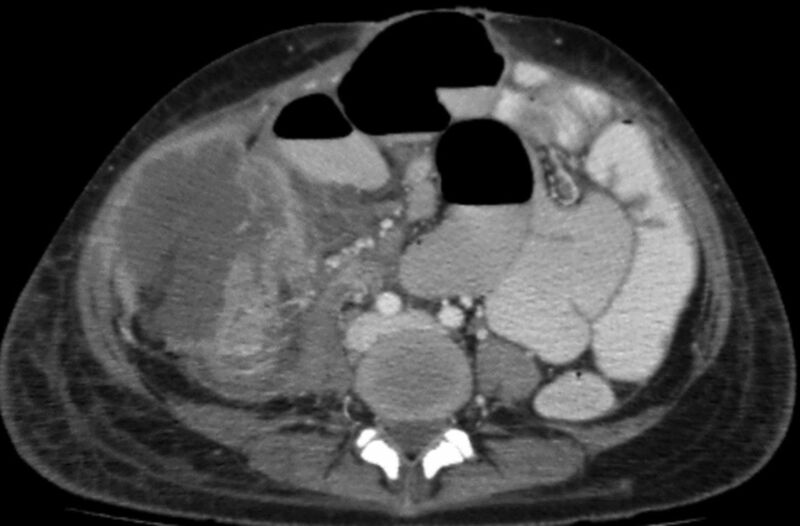 CT scan of the abdomen and pelvis was performed, and this showed: an anterior intra-abdominal collection within the left rectus abdominis muscle measuring 1.9×0.9 cm; a right paracolic gutter collection measuring 1.5×3.7 cm associated with panniculitis and enhancement of peritoneum suggestive of peritonitis; multiple hypodense lesions in the liver consistent with abscesses (figure 3). There were no signs of bowel perforation. Right hemicolectomy specimen showing caecal wall thickening with necrotic debris in the lumen. (A) Axial and (B) coronal enhanced CT of the abdomen: multiple scattered hepatic abscesses, largest seen anterior to the caudate lobe extending downward just above the pancreatic head (arrow). The patient quickly deteriorated with signs of septic shock, and she was taken to the emergency theatre for an exploratory laparotomy. At surgery, an ileal perforation close to the anastomosis site was found. There were extensive white patches over the posterior abdominal wall, small bowel and liver. Bowel resection with primary anastomosis was performed and multiple biopsies of the abdominal cavity were taken for histology and cultures. 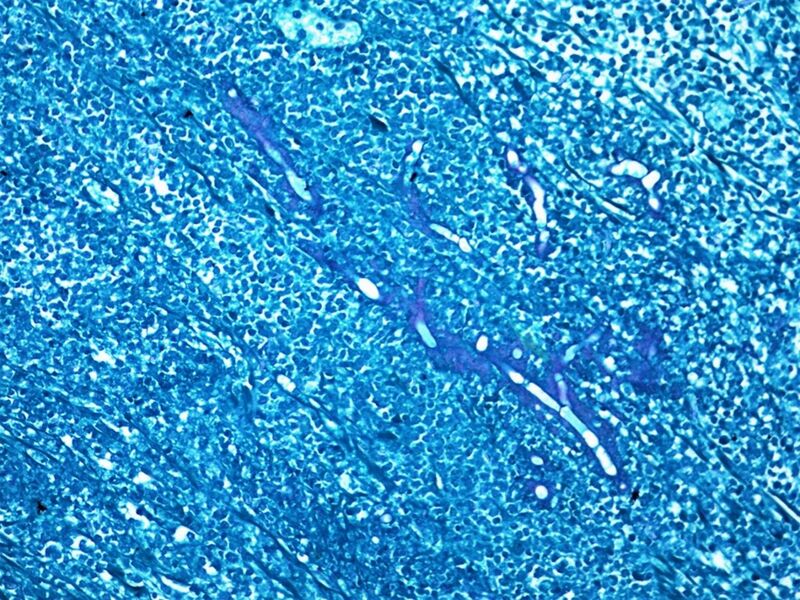 Histopathology showed fungal hyphae invading the bowel wall with positive periodic acid-Schiff and Gomori’s Methenamine Silver stain (figure 4). Splendore-Hoeppli phenomenon was noted. This is a reaction activated by microorganisms like bacteria, fungi and parasites, characterised by the presence of eosinophilic material surrounding the invading organism and forming star-like configurations (figure 5). Liver biopsies showed similar findings (figure 6). Fungal cultures revealed Basidiobolus species. Also, Candida and Klebsiella pneumoniae resistant to carbapenem were isolated. On suggestion of the infectious diseases team, the patient was started on intravenous voriconazole 200 mg twice daily as a part of the antifungal regimen, intravenous tigecycline 50 mg twice a day, and meropenem 1 g three times a day. The postoperative period was complicated by an enterocutaneous fistula opening into the midline laparotomy wound. This was treated successfully with vacuum-assisted closure device and total parenteral nutrition (TPN). Caecal mass, transverse and longitudinal sections of broad fungal hyphae (periodic acid-Schiff fungal stain, ×200 original magnification). Caecal mass, transverse and longitudinal sections of fungal hyphae showing sunburst pattern of Splendore-Hoeppli phenomenon and numerous eosinophils (H&E, ×400 original magnification). Liver biopsy, pauciseptate fungal hyphae with foreign body type multinucleate giant cells (periodic acid-Schiff fungal stain, ×200 original magnification). TPN was then tapered down, and the patient started on regular diet. Inflammatory markers, white cell count and liver function tests returned to a normal range. Clinical conditions seemed to indicate a successful effect of treatment. However, the patient started to be feverish with spikes reaching 39°C. Therefore, CT scan of the abdomen and pelvis was performed, and this showed an enlargement of the right paracolic gutter collection from 1.5×3.7 to 8.4×8.2 cm (figure 7). Also, new development of common hepatic artery aneurysm measuring 2.1×2.0 cm closely related to a porta hepatis/caudate collection extending inferiorly to the pancreatic head (figure 8). A large right pleural effusion was also noted. Axial enhanced CT scan showing increase of the right iliac fossa collection measuring 8.4×8.2 cm. (A) Axial and (B) coronal enhanced CT shows development of common hepatic artery aneurysm (yellow arrow), surrounded by the previously seen abscess anterior to the caudate lobe extending downwards towards the head of pancreas (orange arrow). As an interventional radiology service was not available in our hospital, the patient was transferred to the regional tertiary referral centre where an ultrasound-guided drainage of the intra-abdominal collection was performed. Also, successful embolisation of the common hepatic artery pseudoaneurysm and insertion of a chest tube were carried out. A follow-up CT scan showed that one of the liver abscesses had increased in size to 8.7×6.1 cm and had ruptured in the subcapsular space. An ultrasound-guided drainage of the liver abscess was carried out. Liver surgeons were consulted and decided on conservative treatment. Cultures of the liver abscess showed Basidiobolus species. The patient continued antifungal treatment with liposomal amphotericin B and posaconazole. Clinical conditions remained stable until the patient developed new onset of seizures. MRI of the brain was obtained. This showed diffuse global brain oedema and development of cortical laminar necrosis along the supratentorial gyri suggesting meningoencephalitis. The patient continued to deteriorate and required intubation and high doses of inotropes. A new CT scan showed multiple bilateral lung abscesses. Despite aggressive intensive care unit and antimicrobial treatment, she expired due to septic shock. The patient underwent a right hemicolectomy for an obstructing caecal mass that was found to be fungal-related, and amphotericin B was started. An emergency laparotomy was performed for bowel perforation and further biopsies and cultures confirmed Basidiobolus species infection. Therefore, voriconazole was added to the antifungal treatment. Postoperatively, she developed an enterocutaneous fistula that was treated conservatively with TPN and vacuum-assisted closure device. Ultrasound-guided drainage was performed after findings of intra-abdominal and liver collections/abscesses. The common hepatic artery aneurism was successfully coiled. A chest tube was inserted to drain a large right plural effusion. The antifungal regimen was changed to amphotericin B and posaconazole. She required intensive care treatment with endotracheal intubation after developing gross brain oedema with meningoencephalitis and further dissemination of fungal infection to the lungs. This patient developed disseminated intra-abdominal and pulmonary fungal infection, and despite aggressive treatment she eventually died with sepsis. In the reported case, treatment was initiated on the basis of histological findings as the specimen was fixed in formalin and no cultures could be obtained. However, cultures were positive when adequate tissue was obtained at the second operation. The most important element of diagnosis is a having a high index of suspicion and consider a fungal aetiology in the differential diagnosis, especially in immunocompetent patients. Treatment requires a combination of medical and surgical therapy. The majority of cases will undergo bowel resection under the suspicion of malignancy or in emergency situations such as bowel obstruction. Itraconazole is the most used antifungal followed by amphotercin B.4 9 In our region, several cases have been successfully treated with voriconazole.5 7 10 13 With the growing risk of resistant strains, culture and sensitivity are required to determine the best antifungal regimen. Amphotericin B is effective in only 50% of the cases due to development of resistance.9 In the reported case, the patient showed transient improvement after initiation of voriconazole. However, she developed resistance and disease dissemination. Aggressive fungal strains, misdiagnosis and delay to initiate appropriate treatment may lead to disseminated disease that can result in a very complicated course and reduced response to antifungal treatment. Fungal infection with invasion of the blood vessels wall during bacteraemia may lead to wall degeneration and aneurysm formation. In the reported case, the common hepatic artery (CHA) was the site of aneurysm formation. CHA aneurysms are associated with a high rupture rate reaching 44%, and the risk is higher in the setting of fungal infection. Symptoms include right upper quadrant abdominal pain, haemobilia and jaundice (Quincke’s triad).22 23 Prophylactic treatment is usually recommended in aneurysms >2 cm. Treatment modalities can be non-invasive such as endovascular embolisation with coil, acrylic glue, stent, or sometimes involve surgery with vessel ligation, hepatic resection and venous grafting.23 In the reported case, coiling was carried out successfully. A high index of suspicion is needed for correct diagnosis and favourable outcome. Adequate tissue for histology and cultures is pivotal to identify the responsible fungal species and start targeted treatment with no delays. A multidisciplinary approach is needed, and referral to a tertiary centre is advised. Our thanks to the patient who participated in this study and her family. Dr Eman F AL-Saleh, histopathology consultant, assisted with histopathology pictures and commentary. Dr Eman A AL-Momen, radiology resident, assisted with radiology images and commentary. Our thanks to Dr Nadiah A AL-Audah, histopathology consultant, Dr Sana M AL-Solami, histopathology consultant, Dr Zainab A AL -Ruwai, histopathology specialist, for their support. Dr Mohammad Sager, Dr Ahmad Al-Enizi, Dr Ofays Al-Sallum and Dr Esra Takrouni, surgery department, for collecting patient data.
. Basidiobolus ranarum as a cause of subcutaneous mycosis in Indonesia. AMA Arch Derm 1956;74:378–83.
. Gastrointestinal basidiobolomycosis, a rare and under-diagnosed fungal infection in immunocompetent hosts: a review article. Iran J Med Sci 2015;40:90–7.
. The experience of a tertiary care hospital in the western region of Saudi Arabia and a report of four new cases. Life Science Journal 2014;11:344–52.
. basidiobolomycosis - a rare and underdiagnosed fungal infection mimicking eosinophilic colitis. JCDR 2017;11:13–15.
. Antibody class switching. Adv Immunol 1996;61:79–146.
. Case of ruptured mycotic hepatic artery aneurysm successfully treated using arterial embolization yeungnam university. J of Med 2012;29:24–7. Contributors AOT and MHS are the overall responsible about this study, involved in conception and case report design, collecting data and revising it critically for important intellectual content, writing background, case presentation, treatment. AOT and A.P participated in discussion, follow-up and drafting the manuscript. Part of data collection and writing case presentation was carried out by MA-M. MA-O wrote the data analysis, data interpretation . All authors agreed to be accountable for the article and to ensure that all questions regarding the accuracy or integrity of the article are investigated and resolved.